Thread: Too much RAM usage ! My problem is that my PC uses too much RAM. Now watch, 10 minutes after restart, more process (90), no applications, less RAM. How can i know which process leaks ? And how can i tell which one uses all this RAM if i nothing is using that much on the Resource Manager? Re: Too much RAM usage ! amount of resourses they use. Just a thought, may not apply to your case. Hope this helps. Too much RAM ? What is the other 87% doing? 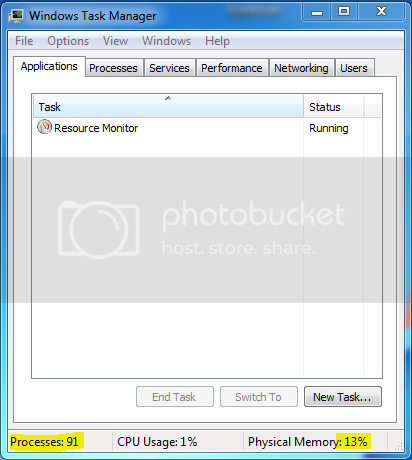 Turn off your Windows Swap file. Force more RAM to be utilized and put less stress on your drives as well as reducing power consumption, reducing heat generated, and speeding up the PC. If, and that's a big if, you BSOD, note which program triggered the error. Kill that software or start a manual configuration of the swap file...minimum 16MB max 4096MB. Can you post images of your MSConfig Startup list of programs, organized by software title name? I'm sure I can pick off a few that you don't need running at all. Check your Start>Startup item list as well. You also answered your own questions as to what process "leaks" or uses up the memory - open up individual program monitors for the items that fluctuate the most in RAM use. 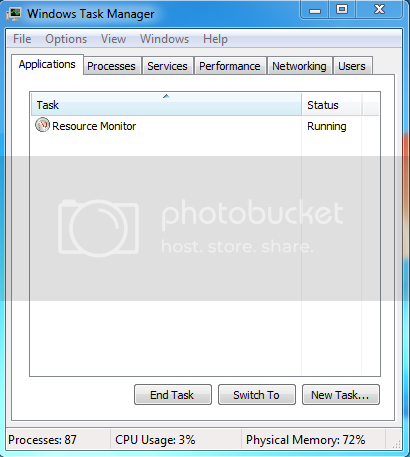 You can see this when you organize the programs in Task Manager/Resource Monitor by CPU or RAM useage: they will be jumping up and down the list. Check out Black Viper’s Windows 7 Service Pack 1 Service Configurations | www.blackviper.com for detailed information about which unneeded services can be safely disabled. The Home page has similar suggestions for older win installations going back to win 2000 sp4. My (not optimized) 8GB win7 system uses virtually no virtual swapfile memory. Right now I have ~ 5.5GB of free ram while running Firefox with almost 60 open tabs, with Processes = 68. You will probably find that after booting, the number of processes will slowly decrease after iabout 8 - 12 minutes. Last edited by profJim; 08-06-2011 at 08:18 PM. 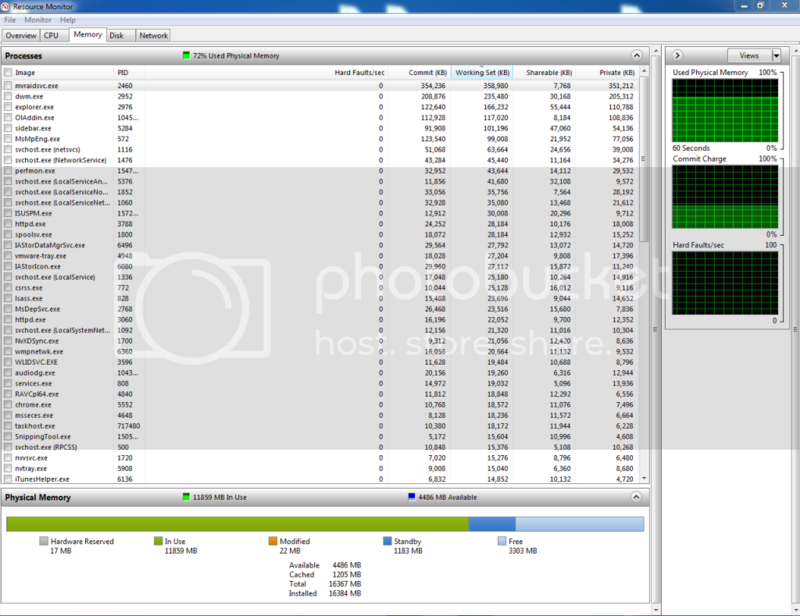 Start the Task Manager, sort the processes by memory usage. 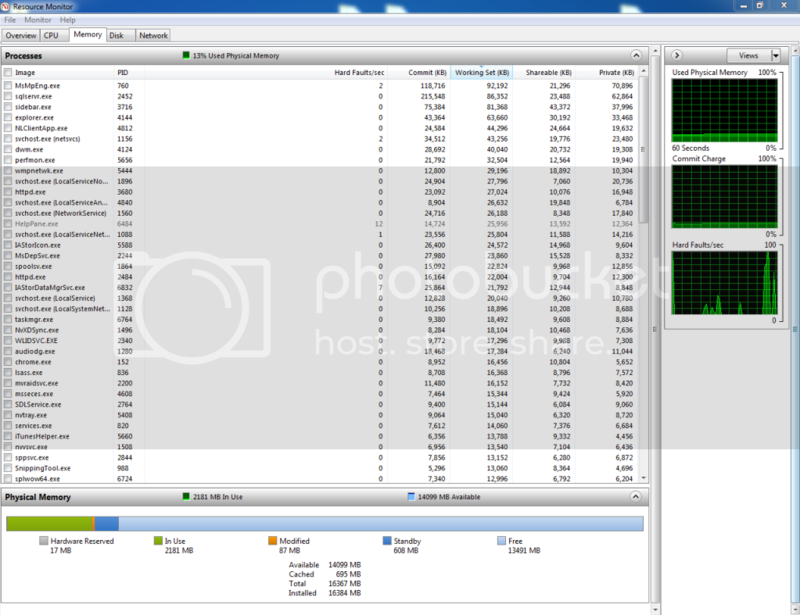 I have 8GB of memory and with 126 processes started (including browser opened pages) I have 5195MB available.